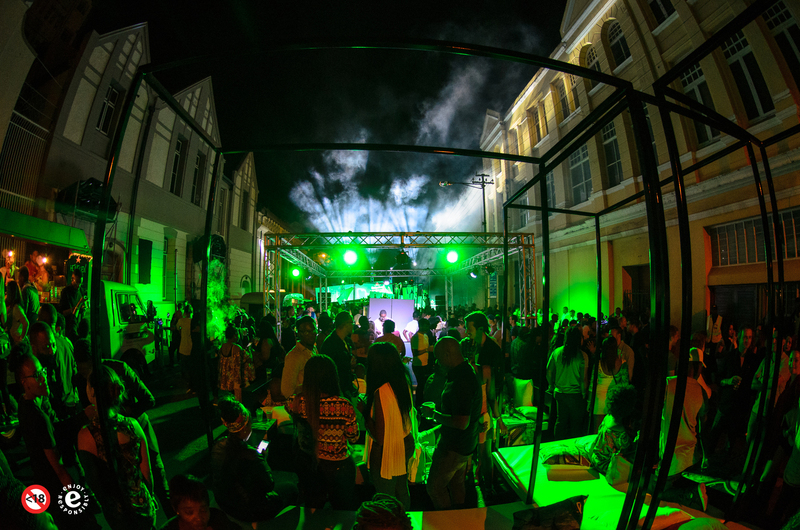 On 21 January 2017, Capetonians experienced Heineken®’s global #ShapeYourCity campaign first-hand as the Mother City’s Namaqua Building in Albertus Street was rejuvenated through a kaleidoscope of light and urban artwork. The stage was set late last year, when Heineken®, the world’s leading international premium beer, set out on a global quest to transform the cities of the world. The campaign saw the names of South Africa’s cities (Cape Town, Johannesburg and Durban) featured on limited edition Heineken® bottles country-wide and fans were urged to show their love by voting for their favourite city in the #SHAPEYOURCITY competition. One city – and its people – would be rewarded with an epic experience brought to life by a “City Shaper” team of urban visionaries who have, by small actions of their own, contributed to shaping cities across the rainbow nation. Ultimately, Cape Town was awarded with the experience, opening the floor for graffiti artist Mak1One and design agency ThingKing to bring their vision to life. The result? A mind-blowing event that celebrated and invigorated the Mother City through design, music and food. Guests at the Namaqua Building were welcomed with ice-cold Heineken®. The City Shaper team’s dazzling 3D sculptural graffiti and designs provided a breath-taking backdrop that showcased their passion for Cape Town. “It was an incredible experience to join forces with Heineken® and ThingKing to create an exciting #SHAPEYOURCITY installation. We made our city shine!” says Mak1One. Some of South Africa’s top DJ talent provided the evenings’ soundtrack, including DJs King Sifiso, Loyd, Franky, Capital, Leighton Moody and performance by Kwesta. Food trucks Stack That, Scandalous and The Sausage Embassy were on hand to ensure that guests receive their fill of the best Cape Town has to offer. “Heineken®’s worldwide quest to rejuvenate the cities of the world has put South Africa – and Cape Town – in the spotlight. The result has surpassed our expectations by far,” says Themba Ratsibe, Marketing Manager, Heineken® South Africa. Follow #SHAPEYOURCITY to catch up on all the action on social media.